Today is Day Five of my trip. We came through the West Bank and are now in the Beit Jala, Palestine. I wish I had taken a yummy picture of lunch. We had one of my favorites, Maqluba – Upside Down Chicken and Rice. We also had five different dipping sauces and amazing homemade bread and a light wheat soup that was mostly broth and very delicious. The funny part, the owner of the restaurant went to Alabama University and so have all of his children. 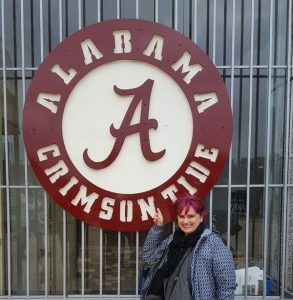 Every room had something with Crimson Tide on it. Then we stopped at Aker Sweets outside of Nablus, Palestine. 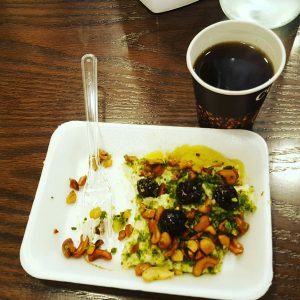 I had one of the best desserts yet – Madlouka, which has a layer of semolina, some type of light cheese filling stuff, roasted cashews, pistachios, candied cherries and honey. I am going to try to get a good recipe so I can share with you at some point. You can follow me on Facebook and Instagram to see more trip pictures. I am working on a few blog posts too so feel free to sign up for those posts. This just sounds like a fabulous treatment! This highly moisturizing treatment provides an excellent improvement of skin moisture, prevents against water loss, increases suppleness and elasticity. Dryness lines are noticeably diminished, skin looks toned, firmed and refreshed. This treatment is fabulous for all skin types, especially dehydrated skin types but not a good idea for acne. I will so need this one when I get off the plane! Extract of Blue Orchids has regenerative and protective effects. The extract stimulates skin’s vitality. It has a moisturizing and antioxidant effect in cosmetic products. Polysaccharide Spectrum Hydroprotector is the ingredient responsible for the instant effect. It has the ability to bind other substances and to transport them into the different skin layers. Helps to smooth out fine lines and wrinkles and boosts the skin’s natural elastin synthesis. Hydroprotector is a biotechnologically gained ingredient with a double hydrating effect. 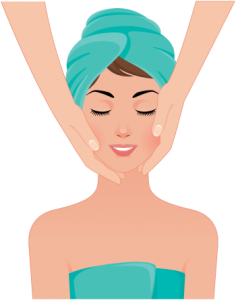 It supplies the upper layers of the epidermis with moisture and counteracts moisture loss. High-molecular hyaluronic acid lies like a film on skin’s surface. It protects the NMF (Natural Moisturizing Factor) and protects skin against moisture loss. It keeps skin supple. Hydroextract is a special plant-based extract which acts as a thirst quencher for the skin. It instantly and sustainably hydrates skin and protects the skin, while also guarding against moisture loss. 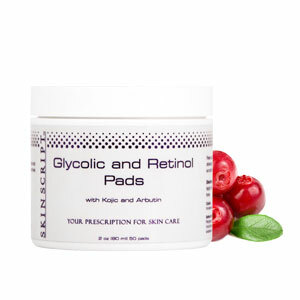 Glycolic/Retinol Pads are designed to gently and progressively renew the skin to provide brightening, clarifying, and restoring benefits to all skin types in need of perfecting. Suitable for all skin types, including hyperpigmentation, melasma, oily and acneic skin. These pads break up surface cells to reveal fresh, healthy skin while allowing trapped oil to release and come to the surface. Kojic and Arbutin lighten sun spots and scars left from blemishes. Apply to face, neck and chest 3 to 4 times per week at night in lieu of toner. Use the Glycolic/Retinol Pads 2 – 3 times per week for pore refinement or acneic skin. For best penetration of this product, use with the Glycolic Cleanser and/or Retinol 2% Exfoliating Scrub/Mask but not all at one time when you are first starting out! For hyperpigmentation or melasma, use daily morning and evening to spot treat, applying only to pigmented areas. Reduce frequency after pigmentation has lightened. Do not rinse; let the product stay on the skin. If you are going through a peel series, use pads twice per day then use as needed once the desired correction is reached. Ok all my mountain bike ladies here is a fun offering from Amber, the Acupuncturist that shares space at the shop. All levels of women are welcome to join our one day clinics. We break into groups based on skill level and make the session all about the rider and reaching their goals. 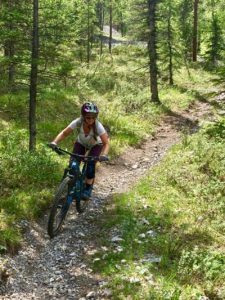 We want to bring women together and help each rider advance their confidence on the mountain bike. We start our day with a progression skills and drills in a safe practice environment. All levels of riders will walk away with improved riding technique and confidence. Our coach to rider ratio allows us the ability to provide personal attention to help dial in each riders skills before hitting the trails. It sounds like a lot of fun if you like that crazy stuff. Amber handles the food so it will be super yummy. So this doesn’t have anything to do with skincare or human health and wellness but it does have to do with health and wellness of Big Cats. I love the things Big Cat Rescue does to enrich the lives of Big Cats. I was lucky to experience their rescue firsthand a few years ago. Anyhow, in the Spring Issue of Big Cat Times there was an article, Dying to be Held – Tiger Cub Petting Promotes Extinction not Conservation. I thought I would share what I learned with you. I never gave this much of a thought really. I know there is a place in Myrtle Beach that does this and I even bought my Aunt tickets to go to this place. Had I really thought about it I wouldn’t have done it. Though I do remember thinking Why are they letting tigers and lions breed? But they do make it sound like they are giving back to the big cats…anyhow I digress. The article written by Howard Baskin, Big Cat Rescue Treasurer, brings the blight of tiger cubs to your attention. Have you ever thought about what happens to the tiger cubs once they are to big to be held for photo ops? Or how the cub’s health can be affected from over-handling and how stressful it must be for them? I didn’t either until I got introduced to Big Cat Rescue several years ago. There is no way to track exactly what happens to the cubs but some end up in roadside zoos in small cages and some are “speed bred” meaning they are bred as quickly and frequently as possible. There is no way to track how many die. In some Asian countries there is a huge push for tiger parts, hides, and bone wine. Some people believe the items have medicinal purposes and can enhance virility (don’t even getting me started on this!). So how can we help the big cats? We can make a conscious effort to not give our dollars to these pet holding places. I mean I am right there with you, who wouldn’t want to hold a baby tiger cub? I totally would and I love tigers but now that I have more information, it is not something I can do. You can support Big Cat Rescue financially or by helping sign petitions when they need them, or contacting state representatives when bills are being brought to the floor.